New for the 2011/2012 hockey season is Alkali Hockey, a roller specific brand, aim specifically at designing, manufacturing, marketing and selling roller hockey targeted products. For their debut line up of gear they are focusing on the essentials including skates, sticks, roller hockey pants, gloves, girdles, padded vests, and bags. And from the look of things we reviewed, Alkali Hockey went all out in making sure every level of hockey player was getting a great product. Cofounded by roller hockey legend Joe Cook and designer Justin Hoffman in early 2011, together they bring over 20+ years of roller hockey industry knowledge to the table. Using what they call “Lithium Science” in the design and construction of all their products, they aim to bring the most advanced materials and construction techniques to maximum the energy yield by each and every player. The biggest release from Alkali Hockey this year will undoubtably be their skate line. 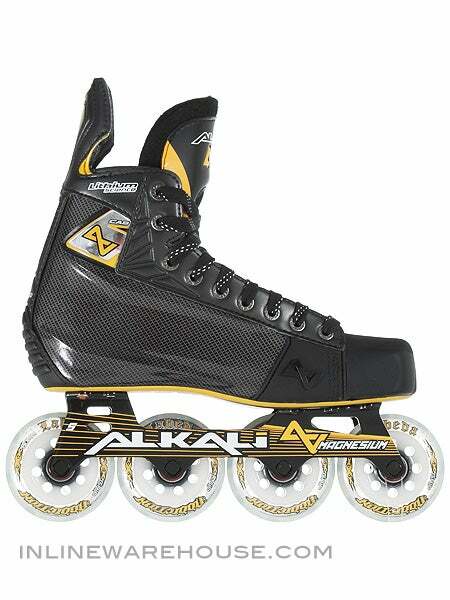 Alkali started from the ground up when developing their skates, to come come up with a truly unique and sleek design. Their top of the line performer is the CA9 skate, which is one of the meanest looking skates we’ve seen in awhile. This entry was posted in Hockey Skate Reviews, Hockey Stick Reviews, Other Hockey Gear Reviews and tagged Alkali, Alkali Hockey, Alkali Roller Hockey, CA9, CA9 pants, CA9 skates, CA9 stick, icewarehouse, inlinewarehouse, Joe Cook, Lithium Science, new roller hockey company, roller hockey pants on November 15, 2011 by Casey.